This weeks theme at Bah Humbug is Things that fly! So I thought I'd use some stamps that I bought in Michael's when I was in Canada last year. The angel and the sentiment are from the same set. 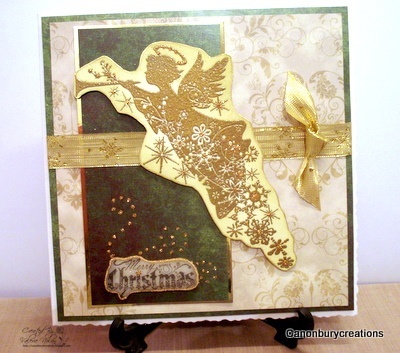 The background papers are matching from Debbi Moore and I used Christmas ribbon as a wrap. oh what a fabulous angel Valerie - looks like the Inkadinkadoo series to me but I might be wrong. Would love to go to Canada, bet you had an amazing time. Love your angel, its a beautiful card. 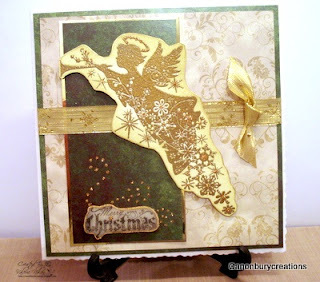 This is lovely Valerie, I have that stamp set too and the images emboss beautifully I think. I coloured a House Mouse image today with the little mice dressed up as angels, I hope to get a card together for this challenge very soon. Ooooooh what a fabulously elegant stamp. Definitely looks 'Inkadinkadoo-esque' but regardless which company is responsible, it looks gorgeous embossed in gold. Thank you for sharing with us at Bah! Humbug! Lovely gold embossing this week, Val. That image is lovely.